The village of Boto in the Ethiopian highlands was selling some of the cheapest coffee in Ethiopia, the notorious "Jimma 5." Now it's selling a bean coveted by specialty U.S. roasters, and has built a road with some of the proceeds. As we reported during Coffee Week in April, coffee aficionados pay top dollar for single-origin roasts. The professional prospectors working for specialty coffee companies will travel far and wide, Marco Polo-style, to discover that next champion bean. But to the farmers who hope to be that next great discovery, the emergence of this new coffee aristocracy is less Marco Polo, more Cinderella: How do you get your coffee bean to the ball? The yellowed highlands around the city of Jimma in Ethiopia are where coffee was discovered in the 8th century. But by the end of the 20th century, its reputation had become as shaky as a car ride on its mountain roads. Carl Cervone, a coffee agronomist for the New York-based nonprofit organization Technoserve, says most of the coffee here is labeled Jimma 5, because it has all five major defects that come from poor farming. "The types of defects that you have include overripe beans, which are called foxies, and under-ripe beans, which are called quakers," says Cervone. There are also cracked beans, and beans chewed by insects. "But the worst of them all, which is called a stinker, which means that you've basically left a bean fermenting for much longer than you should and it becomes rotten, and it's basically like putting a rotten egg in an omelet. It kind of ruins the entire cup," he says. Jimma 5 was so bad it became the trade term for bad coffee in Ethiopia, according to Cervone. 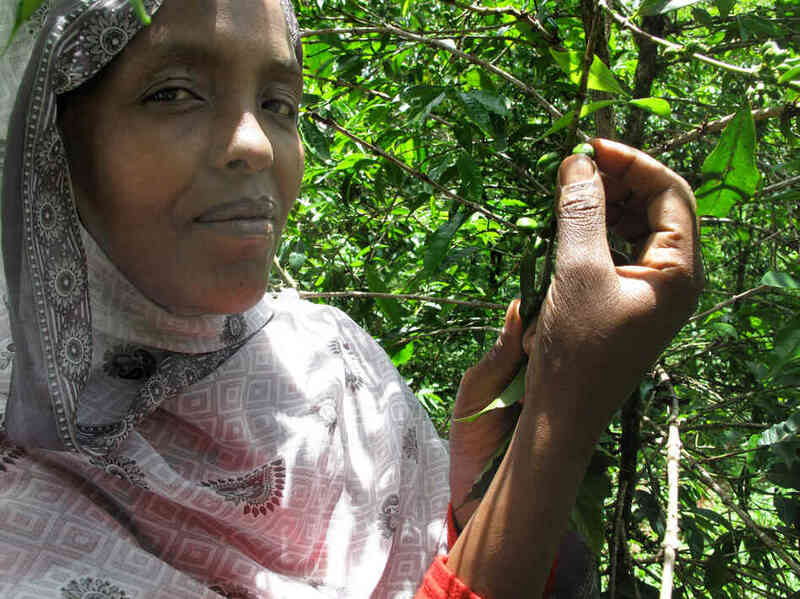 And yet ask one of the farmers here, Haleuya Habagaro, and she'll tell you her coffee isn't just not bad — it's exquisite. "When I roast the coffee, people come to ask where that strong fruity smell is coming from," says Habagaro. "It's like when you hold an orange." Haleuya Habagaro says she always knew her coffee was exquisite. "When I roast the coffee, people come to ask where that strong fruity smell is coming from." So how did her citrus-y coffee get such a sludge-y reputation, commanding even lower prices than the Jimma 5 baseline? She blames the local buyers. Her farm is on the wrong side of a river that swells dangerously by the end of the rainy season when coffee is ready for harvest. Farmers were too poor to build a real bridge. So once they got their mules and sacks of beans across those waters, they were loath to turn back home. Haleuya's neighbor, Sintayehu Abasimel, says local traders would lure them across with phony prices. "In the morning, they announce, 'Please pick your coffee. The price it goes up; please pick your coffee,' " says Abasimel. "But late in the afternoon, no, the price is down." He would have been happy to find other buyers, but his farm was too remote. And to be even considered by one of the elite roasting companies, his beans — like Cinderella — quite literally needed a bath. Farmers here have been harvesting coffee the same way for a thousand years: The coffee fruit is picked and dried. That's fine for Folgers. But if you want to sell to a fancy brand like Stumptown or Sweet Maria's you have to wash off the pulpy fruit and leave only the pit, or the bean, on the drying rack. To do this you need a rather expensive washing machine. And so 113 farmers on the wrong side of the river — some of the worst-paid farmers in the land of bad coffee — formed a cooperative. They called it Duromina, roughly meaning "make us rich." They secured a loan with the help of Technoserve, which also provided training. When coffee prospectors from America arrived in 2010, the farmers were ready. The encounter between the prospectors — Tom Owen, a buyer for Sweet Maria's buyer, and Aleco Chigounis, who was a buyer for Stumptown at the time — and the Duramina farmers was captured on video by a farmer's cellphone. It is like a mirror image of the coffee discovery videos companies post on their websites. But this time, you see the exchange from the farmers' perspective, not the explorers'. In the video, dozens of farmers from the collective encircle Owen and Chigounis. The visitors, to everyone's surprise, use a gadget plugged into their pickup truck's cigarette lighter to roast the beans, then brew several cups of espresso, right there on the muddy main street. There's a lot of nervous laughter from the farmers. This is the moment of truth. And then Owen says, "That's good coffee." The next year the Duromina beans were in the Sweet Maria warehouse in Oakland, Calif., and the name Duromina was on the label of one of Stumptown's top-selling single-origin coffees, boasting "complex notes" of "jasmine, sweet hops and nectarine." With the infusion of new income and some help from the government, the village repaired the roads, brought in electricity and built a bridge over the river that kept them in poverty for so long — a bridge that now, of course, takes their beans right past the city of Jimma, straight through to fancy coffee shops in the U.S.